A John Loomis portrait of Baltimore Ravens linebacker Brendon Ayanbadejo for the August issue of Men’s Journal. ESPN video frame of Escobar performing his idea of “faggotry” as he points to the slur ” Tu Ere Maricon” written on his eyeblack. This coming off the anonymous Fluter Online Magazine interview last week with one of Germany’s leading Bundesliga soccer superstars who says that he is gay but afraid to come out (English coverage of the article in Der Spiegel Online here). The player is apparently out to teammates and team brass, all of whom he says have no problem with his sexuality. But he has a fear of the media frenzy coming out might ignite and the reaction of fans. Some select quotes: “I have to put on a show and deny my true identity every day…I don’t know whether I will be able to take the constant tension between the model heterosexual player and the possible discovery, until the end of my career.” All this told to a 25-year-old reporter for publication in Fluter which is youth magazine published by the Federal Agency for Civic Education. 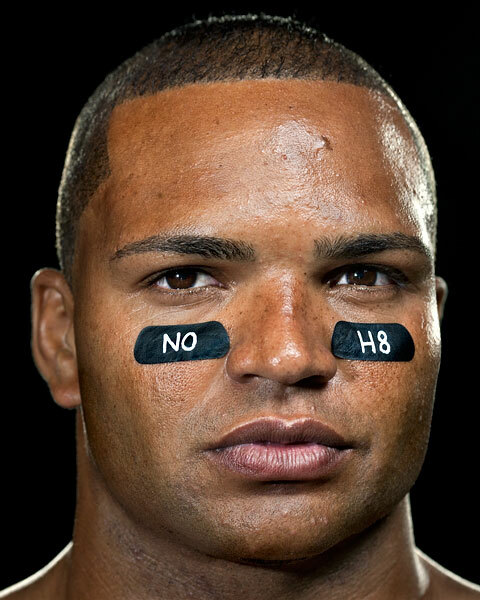 Meanwhile in U.S. NFL football, a storyline of another sort plays out as a Maryland state delegate Emmet C. Burns’s attempt to censure Baltimore Ravens linebacker Brendon Ayanbadejo for supporting a gay marriage proposition on the state ballot backfired, making both Avanbadejo and Minnesota Vikings player Chris Kluwe (who posted a colorful open letter to Burns in defense of gay marriage and free speech) internet heroes of the week. What do yo think? Do these three incidents speak to progress and substantive discourse, or are we simply going round and round in mediated cycles of progress and prudery?